The NetUP IPTV Combine 8x is an all-in-one device designed to provide IPTV and VoD for up to 1000 users. 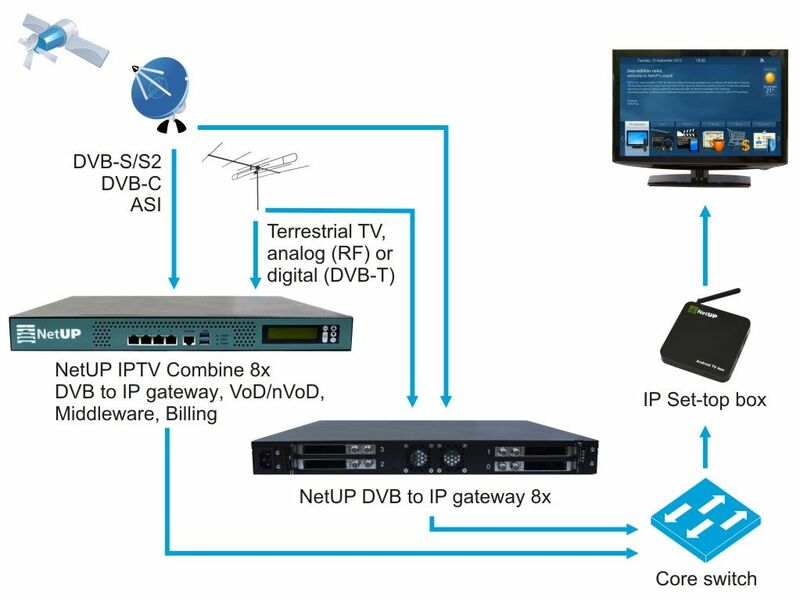 The device includes IPTV middleware and billing capable of handling up to 1000 IP set-top boxes, DVB to IP gateway with 8 DVB inputs and 8 CI slots, VoD server for 50 concurrent streams with 1 TB of HDD space for video content storage. The device allows to deploy IPTV promptly and at minimal costs. IPTV Combine 8x perfectly suits business centers, educational institutions, hospitals, yachts, housing estates, etc. How many TV channels can I receive with IPTV Combine 8x? The device can receive 8 DVB transponders (one transponder per DVB input). The total number of TV channels depends on how many of them you have in each transponder. Also, if the TV channels are encrypted, you need to use conditional access modules (CAM, one per DVB input) and subscription smart cards (one per CAM). Professional CAM’s can usually decrypt 8 - 12 TV channels. So, if you receive and decrypt 10 TV channels with each DVB input, then you totally have 80 TV channels. How to increase the number of TV channels? Can I use IPTV Combine 8x for Internet TV? Can I receive analog TV channels with this device? How is VoD content loaded into IPTV Combine 8x? Movies are uploaded into IPTV Combine via FTP. They are then automatically converted to required format. You can choose codec (MPEG-2, H.264), quality, resolution, etc.